We make various services available on this site including, but not limited to, Warehouse and order fulfillment, and other like services. You are responsible for providing, at your own expense, all equipment necessary to use the services, including a computer, modem, and Internet access (including payment of all fees associated with such access). Copyright (c) September 27, 2012 Innovative Business Services, LLC All Rights Reserved. This site (excluding any linked sites) is controlled by us from our offices within the Texas , United States of America. It can be accessed from all 50 states, as well as from other countries around the world. As each of these places has laws that may differ from those of Texas , by accessing this site both of us agree that the statutes and laws of the State of Texas , without regard to the conflicts of laws principles thereof and the United Nations Convention on the International Sales of Goods, will apply to all matters relating to the use of this site and the purchase of products and services available through this site. Each of us agrees and hereby submits to the exclusive personal jurisdiction and venue any court of competent jurisdiction within the State of Texas with respect to such matters. All notices to a party shall be in writing and shall be made either via email or conventional mail. 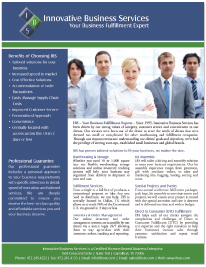 Notices to us must be sent to the attention of Customer Service at info@ibstx.com, if by email, or at Innovative Business Services, LLC 1605 Crescent Circle, Suite 180, Carrollton, TX 75006 if by conventional mail. We may broadcast notices or messages through the site to inform you of changes to the site or other matters of importance, and such broadcasts shall constitute notice to you at the time of sending. Innovative Business Services, LLC ("We" or "Us" or "Our") offers the use of its blogging and message board services (along with the content posted thereon, the "Services") subject to the terms and conditions of use (the "Terms") contained herein. All references herein to "We," "Us," or "Our" are intended to include Innovative Business Services, LLC and any other affiliated companies. By accessing, creating or contributing to any blogs or messages hosted by us (the "Blog"), and in consideration for the Services we provide to you, you agree to abide by these Terms. Please read them carefully before posting to or creating any Blog. We reserve the right to change, at any time, at our sole discretion, the Terms under which these Services are offered. You are responsible for regularly reviewing these Terms for changes. Your continued use of the Services constitutes your acceptance of all such Terms. If you do not agree with these Terms, please do not use the Services. When accessing our Website, Innovative Business Services, LLC will learn certain information about you during your visit. How we will handle information we learn about you depends upon what you do when visiting our site. The information collected is for statistical purposes. Innovative Business Services, LLC may use software programs to create summary statistics, which are used for such purposes as assessing the number of visitors to the different sections of our site, what information is of most and least interest, determining technical design specifications, and identifying system performance or problem areas. For site security purposes and to ensure that this service remains available to all users, Innovative Business Services, LLC uses software programs to monitor network traffic to identify unauthorized attempts to upload or change information, or otherwise cause damage. Innovative Business Services, LLC will not obtain personally-identifying information about you when you visit our site, unless you choose to provide such information to us, nor will such information be sold or otherwise transferred to unaffiliated third parties without the approval of the user at the time of collection.